Used manual with minor shelf ware. 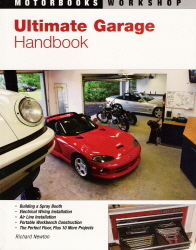 Inside you'll find tips on best utilizing your space, along with 15 step-by-step projects that will take your garage from average to ultimate and make you the envy of the neighborhood! This book takes a real-world approach to each project, including cost, time, tools, skill level, and more. This book includes many color photographs.